ASC provides turn-key multi-channel WxR systems with installation. However, the system interfaces are often simple enough that simulator operators are able to install these devices easily with the provided ICDs. Click to learn more about the ASC WxR simulation. The ASC PWS retrofit is an innovative solution for upgrading existing WxR systems. Many types of WxR systems may be updated with the retrofit – even if WxR source code is not available. Contact us to find out more about this interesting solution . 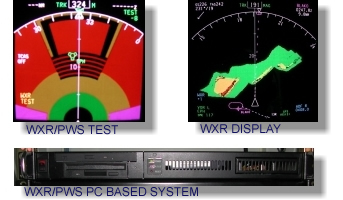 A PC based Honeywell RDR-4B WXR/PWS system emulator was installed on several of the above simulators. Weather Conditons and microburst scenarios are fully selectable from the cockpit IOS. A PC based WXR system emulator was installed in the Sikorsky S-70 helicopter simulator specifically for training in the location of offshore oil wells. The PC system was interfaced to a Honeywell WI-660 cockpit display unit. The WI-660 uses a proprietary (i.e non A708) picture bus data format. Rig Locations are fully selectable from the cockpit IOS. ASC provides turn-key multi-channel WxR systems that simulators may install in their devices. The system is a stand alone PC that reads standard EFIS and/or WxR control panel ARINC 429 buses. Aircraft and WX data is received from the host computer via either Ethernet, RS232, HSD, or whatever means available and ARINC 708 picture buses are formatted accordingly. The operator should specify the number of required WxR channels. are available depending on the requirements of the target device. Storm scenario imagery may be generated by users in the form of JPG bitmaps. These storm cells may be programmed at the IOS to change position, magnitude, and angle, and also may feedback WX information back to the host computer (visual and turbulence data). Other data formats and control bus options are also available (Example Honeywell WI-660 cockpit display unit with SCI control bus).